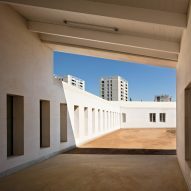 This detention centre for minors in Marseille offers an alternative to oppressive prison architecture through its muted material palette of natural stone and board-marked concrete. 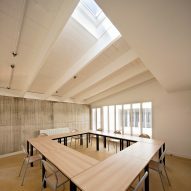 Nice-based architecture office Combas was responsible for designing the facility in the Chutes Lavie neighbourhood of Marseille's 13th arrondissement. 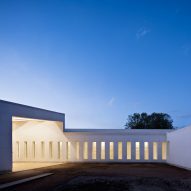 The studio was selected for the project following a competition organised in 2013 by the country's Ministry of Justice, which sought proposals capable of promoting rehabilitation and education rather than simply focusing on confinement. 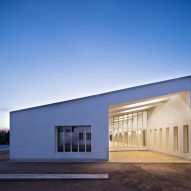 "In the kind of context where security requirements often take precedence over the quality of interior spaces, this project for an educational detention centre for minors was inspired by a strong desire to create a counterpoint," the architects pointed out. "We wanted to make the enclosure disappear in order to open the view of the young occupants onto a new horizon." 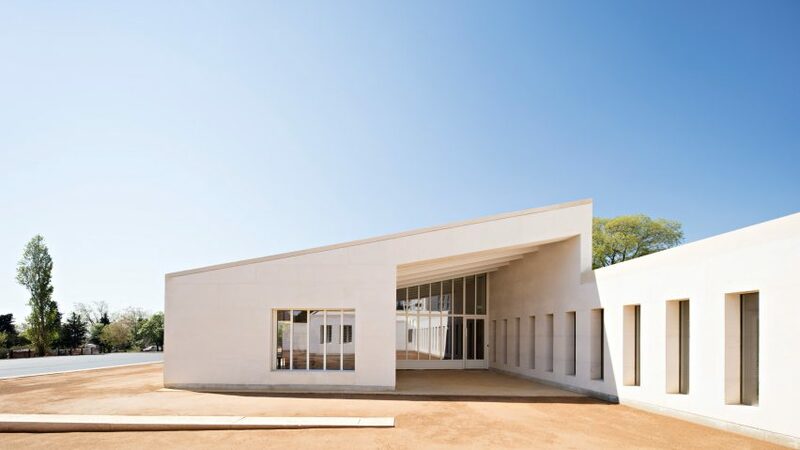 The design developed by Combas features a U-shaped plan with a long spine connected to two shorter wings at either end, which the project team described as a "warm and enveloping form". The main gate leads into a courtyard with an old ash tree growing in one corner. Where possible, the architects tried to retain the agricultural character of the site, which was previously owned by a farmer. Around the edges of a sports pitch to the south of the building, there is space for an orchard, which will be planted by the centre's occupants to give them an awareness of the maintenance and cultivation of fruit trees. The building is arranged entirely on one level, with the accommodation at one end. A corridor resembling a cloister connects this block with the rest of the facility. 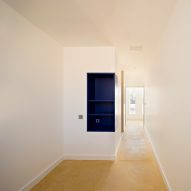 Narrow openings in the corridor's internal wall look onto a courtyard and provide an unobstructed view across the city. The L-shaped sections at either end of the facility pivot out from the main volume to create a sense of enclosure and provide shaded outdoor spaces. In between these two ends is an angled block that intersects with the main spine. It culminates in a recessed end wall incorporating full-height glazing that allows daylight to flood into a central space. 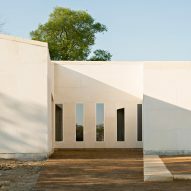 Echoing the local Mediterranean building tradition, the facility's facades are clad in solid stone that adds a natural tactility to the otherwise monolithic structures. Internally, the exposed cast-concrete walls introduce a tone and patina that contrasts with the white-painted surfaces of other walls and ceilings. 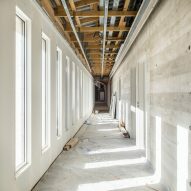 "The use of rough materials allows for the interplay of sobriety and a stripped-down look to provide a warm and robust educational context," the architects added. In the circulation area, the grain and edges of the formwork remain visible, and add a directional detail that is complemented by angled indentations painted in bright colours. Earlier this year at Stockholm Furniture Fair, students from Norway's University of Bergen showcased a series of furniture designs intended for inmates of Bergen Prison. Projects included an embracing chair designed to soothe anxiety and a lamp that anyone can be taught to manufacture.